Today, we begin the start of the shiny, new, weekly podcast that is AquaCast. This is now my full time job, so when I’m not travelling around the sound, I’ll be researching and recording episodes. 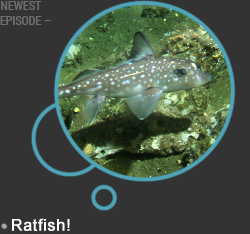 This week our featured critter is the Pacific Spotted Ratfish, the mascot of AquaCast, and there’s some news of the sonic variety. Hope you enjoy, and remember to Keep Swimming! Well, it’s winter in Puget Sound.